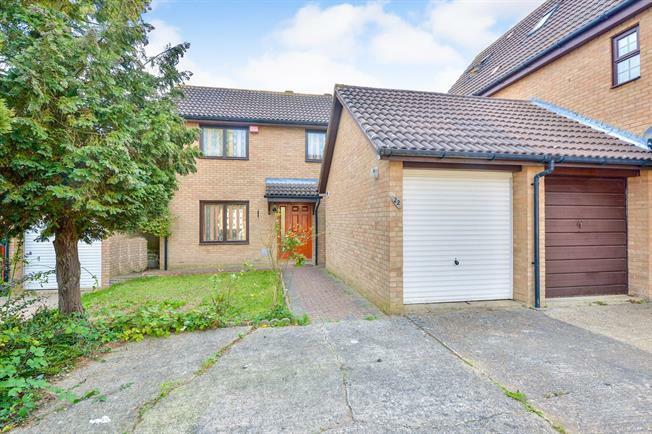 3 Bedroom Detached House For Sale in Milton Keynes for Asking Price £280,000. This fantastic detached house situated on a good sized plot within walking distance to Central Milton Keynes and the Station would make the perfect family home or BTL. The property in brief comprises of; entrance hall, cloakroom, kitchen/diner, lounge. Stairs rising to 1st floor, bedrooms one, two and three and family bathroom. Outside of the property there is a good sized rear garden that is mainly laid to lawn and to the front of the property there a garden, driveway and single garage. Steel sliding single glazed door, opening onto the garden. Single glazed wood window facing the front overlooking the garden. Radiator, carpeted flooring, artex ceiling, ornate coving, ceiling light. Single glazed wood window facing the front overlooking the garden. Tiled flooring, artex ceiling. Wooden back double glazed door, opening onto the garden. Double glazed wood window facing the rear overlooking the garden. Radiator, laminate flooring, under stair storage, artex ceiling, ceiling light. Granite effect work surface, wall and base units, stainless steel sink, integrated oven, integrated hob, stainless steel extractor, space for dishwasher, space for. Double glazed wood window facing the front overlooking the garden. Radiator, carpeted flooring, artex ceiling, ceiling light. Double bedroom; double glazed wood window facing the front overlooking the garden. Radiator, carpeted flooring, a built-in wardrobe, artex ceiling, ceiling light. Single bedroom; double glazed wood window facing the rear overlooking the garden. Radiator, carpeted flooring, artex ceiling, ceiling light. Double glazed wood window facing the rear. Radiator, tiled flooring, artex ceiling, ceiling light. Low level WC, roll top bath with mixer tap, pedestal sink with mixer tap, extractor fan.